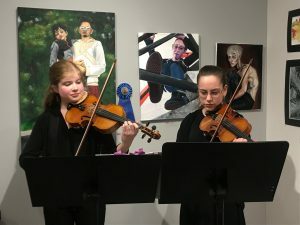 The B roome County Arts Council (BCAC) opened the Broome County High Schools’ 2019 Emerging Artists Competition & Exhibition on Friday, April 5, 2019 at Artisan Gallery (on 95 Court St., next to Chroma Café) at 6PM. An awards ceremony open only to the participants will be held from 5-6PM. This exhibition will be on view through Saturday, April 27. Each year, BCAC invites the area’s High School Art Teachers to choose up to 12 pieces of exemplary visual art work to be adjudicated by professionals working in the community. This year, 82 artworks will be featured, including for the first time, 6 works of sculpture. 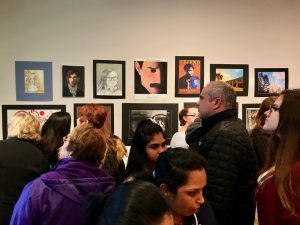 Exhibited artworks are from students at 8 area high schools, including Binghamton, Chenango Valley, Johnson City, Maine-Endwell, Susquehanna Valley, Union-Endicott, Vestal, and Whitney Point. Six awards were granted: Composition, Line & Color, Originality, Use of the Medium, Level of Difficulty, and Best in Show. Judges this year include Emily Jablon of Jablon Studios, Greg Chianis of Chianis & Anderson Architects, Judy Salton, artist, Alessandro Segalini, Assistant Professor at Department of Art and Design at BU, Joanne Arnold, artist, and Janice Wood, artist and Board President of FASST. Each artwork is scored in the five awarded categories, while “Best in Show” to be the one with the highest score. Best in Show: Kayla Ferris, “Ambition”. Colored Pencil. Chenango Valley High School, Art Teacher: Matthew Wilson. · Composition: Ciera Smith, “True Colors”. Colored Pencil. Susquehanna Valley High School, Art Teacher: Joyce Russell. · Line & Color: Erin Hurlbut, “Vase”. Wood Fired Ceramics. Whitney Point High School, Art Teacher: Will Manvell. · Originality: Wyatt Zindle, “Untitled”. Ceramic, Acrylic, Paint. Vestal High School. Art Teacher: Pete Durham. · Use of the Medium: Audrey Higgins, “Folded”. Oil on Canvas. Main-Endwell High School. Art Teacher: Jean Burlingame. This year’s exhibition is sponsored in part by FASST (Fine Arts Society of the Southern Tier), who will award the $100 gift certificate to the winner of the “Best in Show” category. Next year, the Emerging Artists Competition & Exhibition will be held in March in collaboration with FASST for Art in Schools Month and will introduce a special category to be announced later this year.